At the Open, or ATO as it’s sometimes called, is a trading strategy created by DayTradeToWin.com. The strategy focuses on finding morning trading opportunities in the E-mini S&P and other markets. Typically, the E-mini and similar futures start to “take off” around 9:30 a.m. US/Eastern. For the first couple hours of the day, volatility is typically the best for trading. When volatility begins to increase at the market open time, there is often a breakout trading opportunity. This forms the basis of what the ATO is all about. Price action is using the information directly on your chart to trade – no indicators. That’s the goal of DayTradeToWin’s trading courses. The ATO can be traded by using price action or the accompanying indicator software for NinjaTrader. Normally, after learning from the course and the live training, you manually look for trades as each candle plots on a 5-min chart. The software does the looking for you. When a valid ATO trade is found, a signal appears and an optional alert sound is played. In addition, a line is drawn that points to the entry candle. At that point, it’s up to you to place the trade according to the rules. Like other courses in DayTradeToWin’s lineup, the ATO uses the ATR (Average True Range) for profit targets and stop losses. The philosophy is that the market can realistically only produce so much potential profit at one time based on its recent volatility. As such, a trader’s expectations should be inline with a measure of this potential. That’s where the ATR comes into play – it’s a measure of recent volatility. According to the ATO method, A simple mental formula is all it takes to decide what you’re profit target should be. The stop loss is also calculated using the ATR. On average, a trader can hope for a couple of ATO trades per day. A written course fully discloses all elements of the strategy. The live trading further solidifies understanding. Email support is included. After purchase, you can expect email delivery within an hour or so. A training video is provided soon after. Some traders may be able to learn the strategy in a single day. The ATO 2 software has been optimized for NinjaTrader 8. The indicator’s settings look great on both dark and light skins. Performance seems to be faster compared to the previous NinjaTrader 7 version. Overall, it’s easy to see why the ATO has returned to the forefront of DayTradeToWin.com’s lineup. 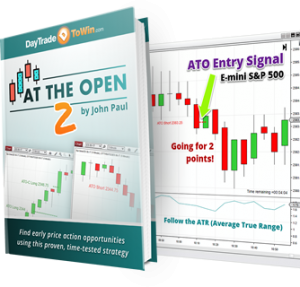 The ATO (At the Open) was DayTradeToWin.com’s first publicly released trading strategy. As a flagship product, the course became very popular. It paved the way for additional signal software such as the Atlas Line and Trade Scalper. Eventually, the ATO was made exclusive to the eight-week coaching program called Private Mentorship. Very recently, the ATO 2 was released for NinjaTrader 8 with considerable improvements. Read on to get an idea of ATO 2 basics seen in this video and how it can improve your trading. The E-mini trade here was worth seven ticks. That equals $87.50 in profit before commissions and other trading costs. Multiply that profit by the number of contracts trade to get an idea of potential profits. Of course, each traders ability to invest greater amounts depends on personal risk capital. Trading is risky. Only trade with money you can afford to lose. Traditionally, markets have greater volatility at various periods of the day. In the United States, for quite a long time, trading markets opened at 9:30 a.m. US/Eastern. Although markets are electronically traded these days, companies and trading systems continue the 9:30 a.m. tradition for markets like the E-mini S&P. If you open an E-mini S&P chart, you will generally see slower activity prior to 9:30 a.m. US/Eastern, followed by a substantial increase for the next hour, at least. During this first hour or so, conditions are often ideal for trading. This is where the ATO 2 steps in. What is the ATO 2? The ATO 2 is a pattern of price activity that you’re taught how to identify. By looking at a chart’s price activity, you will be able to see specific candle formations that constitute a trading opportunity, also called a “setup.” The ATO 2 can be classified as a breakout strategy. That means you are waiting for price to break out of a specific range. Once this occurs, you can place a trade. The ATO 2 package includes an indicator programmed for NinjaTrader 8. This indicator plots a signal letting you know when to place a trade. This signal also indicates the expected market direction. Instead of manually looking for the trades yourself, the software automatically finds trades and tells you when to enter (place the trade). Exiting the trade must be manually done by the trader. You are taught the profit target and stop loss strategy. In short, you will place the profit target relative to current market conditions. If the market is more volatile, then it’s able to potentially produce more profit, so that means a larger profit target. Similarly, a more volatile market may fluctuate more, so that means the stop loss is also increased to prevent premature exiting. The included live training and training video covers everything you need to know. The ATO 2 works with futures and forex markets. The software is expected to soon support MetaTrader (the world’s most popular forex trading platform), so stay tuned for updates. It's one of those strategies that every trader who trades futures should definitely take a look at. It's very solid. ATO 2 indicator is easy to use. Support is responsive.